The web emerges into most parts of our daily life. In our everyday office hours, information and conversation interplay through the lenses of the web, either internally through the intranet, or externally through all our interactions with web sites and services. Obviously this blurs into our more nomadic urban life, where our mobile devices serve up as our embodied knowledge network expanders. The emerging lifestyle with blurred realities, work, family and friends do stress new ways to govern our enterprise web spaces. Networked conversations in your private and professional life have to be a learning process. In my research and practice, Web Governance repeats as one unsolved riddle, both for large enterprise portals (read intranet) or external web portals and sites. This governance theme have been heavily debated in communities of practice amongst Internet and intranet professionals, where several really good ideas and practices have been elaborated to find a design pattern that fits for purpose in our networked business environment. The term Web will in this context cover the enterprise information and communication spaces where web technology is the key delivery mechanism, be it enterprise portals / intranet, internet sites or extranet in all modalities stationary/mobile. Inside the corporate wall and outside web governance have different set-up, but when the open and networked everyday life unfolds, things will be very similar. User Adoption, and engagement in the continuous evolving business demand to everyday use of Web platforms. Can we govern a series of moving targets? A networked Web Governance model…. This simple work-flow illustration stretches to the two core implications with User Adoption and conversation and pragmatic steps to make ‘the Web’ space development more transparent, second the ‘builders‘ view. The latter have been pretty detailed over the years with a set of useful good practices and patterns, such as Enterprise Architecture, ITIL, agile methods and other means to deliver new features to the Web. The core problem, relates to the initial conversation amongst actual end-users, about i.e. their intranet experiences and business demand. Over the years we as practitioners have tried to take ‘hostages‘ through different means of end-user participation methods (i.e. UX), but in most cases I have discovered both in practice and research we end up having’ the ‘developers‘ (web professionals) driving the scene. The developer’s guild will obviously encompass, both ‘content owners’ and communication professionals, and all different pieces of the ICT folks trying to deliver the Web technologies. I know it is pretty unconventional to pair the communication professionals and ICT folks into one coherent group, but in reality they have melded together. Obviously, as with Intranet Managers, they usually derive from the communications guild, but since they have to cope with a ‘social technology artefact’ being the CMS, Portal, Search or whathaveyou techie stuff, they learn to master the language of the ICT folks to be able to reach for their everyday business demand to deliver a decent working platform to undertake their craftsmanship. Similar to the ICT people working close with the communicators, they sooner than later try to become web communication ‘savvy’, with some difficulty 😉 . Regardless of this, these two Communities of Practices have so far represented the ‘business’ in the lion part of all decision-making bodies to deliver the intranet, enterprise portal or Internet sites. All in all they do represent the Professional Web practices, meaning people working everyday delivering content or technology for the Web. With the advent of Emerging Social Software Platforms, Andrew McKefee (read web 2.0 technologies) there is a new player to the Web Governance game: the business end-user, who contributes daily through their ‘in-the-flow’ conversations with peers. In IS research, the Diffusion of Technology and Innovation is omnipresent! There are bulk loads of stories/research data from ERP, CRM, CSCW and so forth that show how crucial User Adoption is to reach for real business values, and how often misuse, no-use and so forth diminish the outcome of the investment in any ICT platform. The ambition with the outlined and proposed (simple) Web Governance Model is to bridge this gap through open-conversation spaces (emerging social software platforms, web 2.0 technologies). To be able to cultivate a vivid, cultivated community that in a highly dispersed and networked manner engage in the development and change of the enterprise Web platforms. As many gurus within intranet and web, have stated there are some commonalities for an i.e. 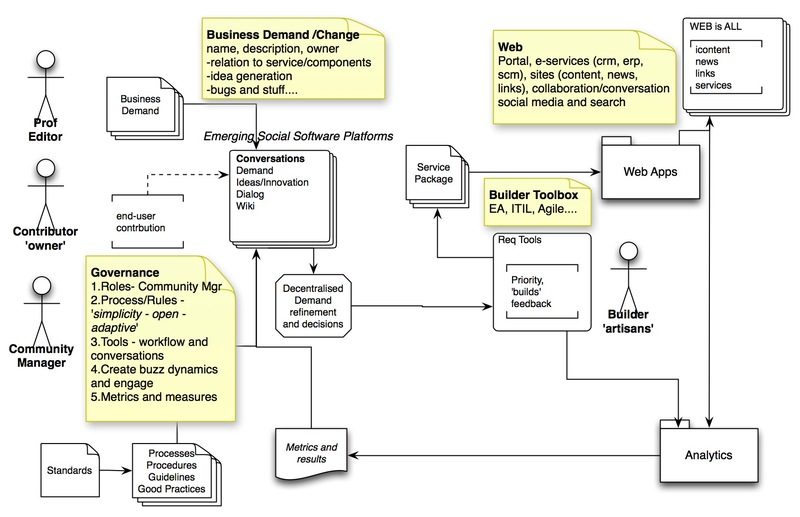 Intranet Strategy and Governance model. Mr Martin White compiled a simple and descriptive model 2007 that still works as good bedrock for our conversation. Lacking in this model is User Adoption and Participation. It has three dimensions: steering, operations, and lastly development. As stated by Martin White , Jane McConnell, Gerry McGovern and others in the ‘guru‘ conversation, there is no one-model-fits-all! The set-up for any given enterprise has some similarities or patterns, but then reality comes in and strikes back. In the best of worlds we all would like our key leaders and managers, such as the CEO, CIO, VP HR, VP Communication etc to become owners of the Web Governance. Over the years, and in enterprises that have a more matured governance model, they do act in the Web Governance space; in other it is less obvious who will take the lead in all this. It would also be very nice to have the strong leaders/managers from the key areas in the business to take active part in the governance of their enterprise web, such as marketing, sales, supply chain, operations or Research & Development. Simultaneously with the efforts to bring the managerial resources to the dinner table, there is a need to close the gap to the IT-Governance model. Sometimes these resources do overlap, sometimes not. In several cases that I have written about in my research there is an emerging practice to deal with web governance, but this is continuously interlinked with the means (money): The IT-governance people do act and own the money to invest in the infrastructural pieces that make-do of any Web. Power Relations and politics!!! Too play any game, as board games like chess, backgammon or why not Monopoly, we all need a set of common rules (standards, policies, operating procedures), but the actual game playing is like a live soap-opera. In the Networked Web Governance model, the main idea is to bring in ‘social constructs’ derived from the open-source movement. If the model is able to cope with different levels of granularity, dispersed open decision making amongst many agents in real-time through Emerging Social Software Platforms we will be able to boost User Adoption. The democratisation of the business demand and change conversations from the Web Professionals scene to all users, with a strong focus on Communities, will be the lever. Essential in all this, is that when the developers ‘black box‘ is open, and the conversation flows. The users do not have to cope with professional ‘lingo‘ to express their needs, instead the social fabric of networks will bridge this and make-do of the conversations and translations between practices. All Artisans, like ICT-folks, Communication pros’ use different means and tools to communicate. A common allegory: When you buy a house you invite several different crafts to both translate your ambitions to what the house should look like, what features and uses you intend to have with this artefact in a social fabric. They all translate this into their descriptive models and simplifications to both make-do of their internal practices communication, but also between practices (carpenter, plumber, electrician, roofers, architects and so forth). You as the forthcoming user of the house will have the opportunity to both compile their detailed schemes and models, but most often you trust their craftsmanship. Sometimes you as a house buyer have difficulties to express your inner thoughts about the social use of the house, and the artisans deliver a house with a disjoint end-user experience….but if you had the option to tap into ‘all’ house buyers networks, combined with the artesian common place knowledge in their standards and guidelines as well as their internal discussion. You would at least have the option to be able to have a more fluent dialog. And hopefully your house would emerge into something you actually asked for, or want move into! This entry was posted on Tuesday, July 13th, 2010 at 10:58 pm and is filed under Enterprise 2.0, governance. You can follow any responses to this entry through the RSS 2.0 feed. You can leave a response, or trackback from your own site. and guess your connection status with a 65 % accuracy. “Hot Dog Consuming Contests” seriously does gives me away as a single lady?